Welcome to Cambridge Manor Estates! Choose Your Lifestyle... Excellent neighborhood; Private, quiet and peaceful; In a convenient location; Gracious decor; Spacious rooms; Modern appliances; Roomy closets, cupboards and pantry. Like living in your own home. Large two bedroom apartment homes. 1100 & 1300 square feet. Laundry with washer, and dryer included. All apartments come with two full bathrooms. Elegant living with the air of English Country Estate. Located in Ingham County, Lansing, Michigan. Cambridge Manor Estates is a "Pet Friendly" Community. 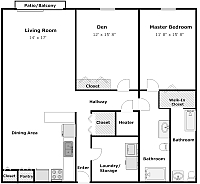 Plan A with approximately 1100 square feet. Plan B with approximately 1300 square feet. Walk-in closet and full bath. All units have two full baths. To view this form you will need the free Acrobat Reader.